Maybe girls do just want to have fun. 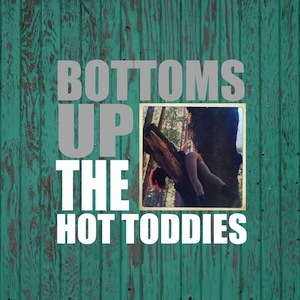 The latest from Oakland’s Hot Toddies, the five-song Bottoms Up EP, is like Cake meets The Raconteurs with more PMS. Veiled in jovial harmonies are tales of cocaine, teen pregnancy, and hot, hot sexual desire. The group has a sense of humor reserved for those from Venus: “I’m feeling nauseous, and to think of it my period’s a bit late,” goes the song “It’s Not Right.” If the band has an earnest side, it’s lost among their bursts of nonchalant bitterness. Production and songwriting are sparser than sparse. Guitars lilt and occasionally crunch, but besides bells and a sticky electric organ on “Hey, Hey,” there’s not a lot going on here. It’s a style that’s in sync with previous releases, and whereas most pop aims for bombast, The Hot Toddies play with little fuss. It all depends on how busy you like your music. The real bite is in the lyrics, where getting “knocked up at 17” worries their mothers more than themselves.